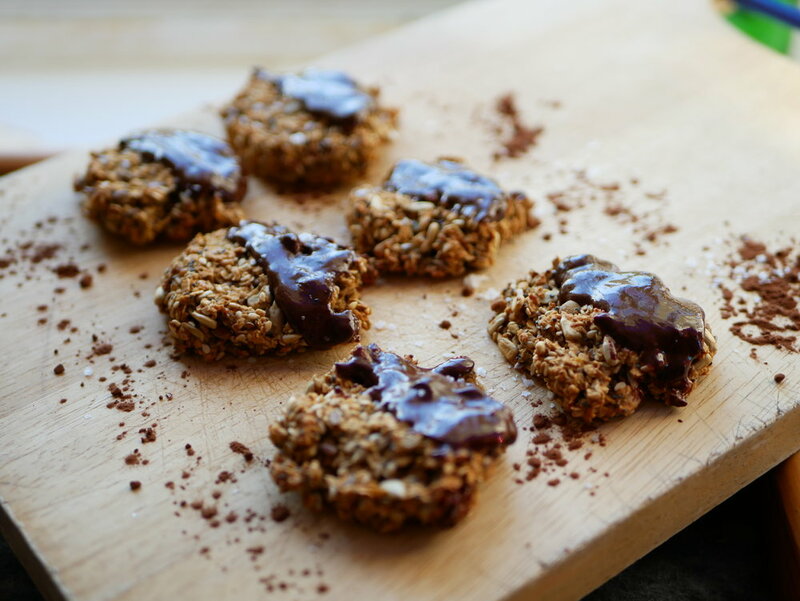 These simple ginger and chocolate oat cookies are very easy to make. I wanted to come up with a recipe that didn't require a food processor - just a baking bowl, a baking tray and an oven. They take five minutes to throw together and around twenty minutes to cook... if my oven can be trusted - which it can't so keep your beady eyes on those bad boys whilst they bake. Preheat oven to 180’c. Pop the oats, mixed seeds, organic sugar, and ginger in a bowl. Mix thoroughly and then add water drop by drop until there is enough to stick the mixture together. Roll into balls and flatten onto grease proof paper on a baking tray. Pop in the oven for 20 minutes. Melt the dark chocolate. Mix the chocolate with two tsps of honey and drizzle on top. Enjoy warm with a cup of tea.